Learn the stories of everyday people finding and going after their true life purpose. If they can do it, so can you! On this special episode of Purpose is for ALL podcast, we have the amazing Jeanne Enstad! Jeanne died twice, went to Heaven twice, and is now telling us what Heaven is like and the message Jesus gave her. This podcast episode is guaranteed to inspire you and let you know that Heaven is real! It will also help you understand who Jesus truly is and the message He wants you to hear! Don't miss this awesome Good Friday episode! Learn more about Jeanne and get her book at: http://ajourney-of-hope.com/ . Learn more about my life coaching at: www.marlielovelifecoaching.com. On this week's episode of Purpose is for ALL podcast, we have Aimee Manzoni-D'Arpino. After Aimee's son passed away from substance abuse disorder, her new purpose awakened to help educate and advocate others about substance abuse. This episode will help you understand that in every season of your life, God is there for you and with you. You'll also learn about why the "uncomfortable" feeling, may not be a bad thing. Don't miss this episode! It's REALLY good! If you would like to get in contact with Aimee, you can email her at aimee@addictionpolicy.org. Be sure to subscribe to hear more episodes of Purpose is for ALL podcast. Learn more about me at www.marlielovelifecoaching.com. On this week's episode of Purpose is for ALL podcast we have Grammy and Dove Award nominee Delano A. Johnson. Delano Johnson is not only a talented musician and author, but also a brand architect that cares for God's people. In this episode, you'll understand that nothing can stop you from God's purposes in your life! You'll also get to hear why Delano says losing millions caused him to live his purpose! Be sure to get Delano's book, Refuse to Live Talented & Broke, at www.delanojohnson.com and use promo code "BrokeandTalented" to get 10% off of the book! Don't forget to subscribe for more episodes! Learn more about my coaching and sign up for my new online training program at www.marlielovelifecoaching.com! On this week's episode of Purpose is for ALL Podcast, we have Rachel Smets with us! If you've ever wanted to travel and/or live abroad, you NEED to hear this episode! Rachel is a TEDx speaker, Culture Trainer, lecturer, and bestselling author. She's on a mission to inspire fellow solo travelers to live abroad successfully! You don't want to miss this episode! It will help you understand purpose AND taking that leap of faith to move or travel abroad! Learn more about Rachel Smets at www.rachelsmets.com. You can find her on Facebook, Instagram, and YouTube by searching Rachel Smets. Learn more about my life coaching at www.marlielovelifecoaching.com. On this week's special International Women's Day episode, we have confidence coach Trish Blackwell. Trish is the epitome of an extraordinary woman! She's battled her way out of an eating disorder, trauma, debt, and more to become a leader to women around the world. You want to listen to this episode if you've ever battled with confidence issues or felt less than! This has to be one of the best episode's I've ever recorded! It's filled with inspiration, determination, and everything that International Women's Day represents! Learn more about Trish and her pocast by searching "The Confidence Podcast with Trish Blackwell". Learn more about my coaching at www.marlielovelifecocahing.com. On this week's episode, we have the awesome Averianna the Personality! Averianna is a tv host and entertainment personality who has covered the BET Soul Train Awards, NAACP Awards, All Star Weekends, and other red carpet events! She currently works as a talent assistant on the Pickler and Ben show in Nashville, TN! Averianna is an inspiration and light to the entertainment industry! You have to hear how she "intercedes" for entertainers and why she believes how you've always known your purpose (even if you didn't realize it)! Be sure to follow Averianna on Instagram: @iamaverianna. Be sure to subscribe to this podcast and visit my website: www.marlielovelifecoaching.com. On this week's episode of Purpose is for ALL Podcast I interview, bestselling celebrity ghostwriter and #1 Amazon bestselling author Christine Whitmarsh. Christine has ghostwritten for Emmy winners AND rock stars. You'll be able to hear some name dropping in the episode too. Learn how God ignited a flame within Christine to get her to focus on her purpose. If you feel like you're good at a lot of things, but you're not sure what to focus on.... this is the episode for you!! Learn more about Christine at http://theinkagency.net/home-mobile/. Learn more about my life coaching at www.marlielovelifecoaching.com. Be sure to subscribe! Purpose is for ALL Episode 41 with Miz J! On this week's episode of Purpose is for ALL, we have Miz J (aka Jennifer Primous) with us! Miz J is the founder of P.U.M.P.S for Women, Inc.; a multicultural women's organization whose focus is to empower women and and enrich families! She's also a published author, life coach and empowerment speaker, and host of "Miz J in the Morning" an international radio show! Have you ever heard that there's no such thing as a coincidence? You need to learn why being wrong may lead you to your purpose! Don't miss this episode! To learn more about Miz J, head to https://www.facebook.com/PUMPSForWomenInc/! To learn more about my life coaching, head to www.marlielovelifecoaching.com! On this week's episode of Purpose is for ALL podcast, we have comedian Raheem Tha Dream! Raheem Tha Dream is an actor/comedian and host with a larger than life personality (and he has skits that have gone viral!!)! This episode will not only inspire you to follow your dreams, but also have you laughing as well! Learn three things that Raheem Tha Dream says will help YOU live your purpose! If you want to break into the entertainment industry, this is the episode for you! Be sure to follow Raheem Tha Dream on all social media platforms: @raheemthadream Learn more about my "live your purpose" life coaching at www.marlielovelifecoaching.com. On this week's episode of Purpose is for ALL with Marlie Love podcast, I speak with Walter Finnigan, Walter is the director of LEAF Advising for the John Maxwell Team. He trains people around the world (including children) to help them reach their full potential. Don't miss this episode, because you'll learn more about why beauty fits in purpose AND why just sitting in a church isn't going to ignite your purpose! 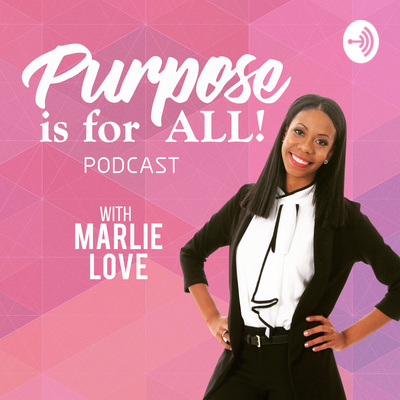 Be sure to subscribe so you can hear more episodes of Purpose is for ALL with Marlie Love podcast. Reach out to Walter at www.walterfinigan.net. For life coaching with me, head to my website: www.marlielovelifecoaching.com. On this week's episode of Purpose is for ALL with Marlie Love podcast, I interview Karen Ford. Karen is a Christian Master Financial Coach, Public Speaker, Entrepreneur, and Best- Selling Author. Learn why Karen believes that you can find your purpose if you understand what makes you mad, sad, and glad! Be sure to subscribe to Purpose is for ALL with Marlie Love podcast, so you can hear new and past episodes! Learn more about Karen Ford by going to: www.karenford.org. Learn more about life coaching with me at: www.marlielovelifecoaching.com. On this week's episode of Purpose is for ALL, we have Irnande Altema. Irnande is a first generation lawyer and the Policy Director of Special Populations at the Mental Health Association of Maryland. She founded FirstGenRise to create a platform for first-generation law students, graduates, and attorneys navigating the professional world. She is also the author of “The Rise of a First Gen” which journeys the struggles and successes of a first-generation American determined to rise. Don't miss her advice on how to discover YOUR purpose and why the movie War Room is what changed it all for her! Get Irnande's book at www.firstgenrise.com/book! She has some great packages with her book. My book, Five Steps to Finding your Purpose and Destiny is now available on Amazon!! Get it today here: http://a.co/d/fupFvoE. Learn more about my coaching at www.marlielovelifecoaching.com. On this week's episode of Purpose is for ALL, we have the amazing Corey Banana. Corey is an exquisite person and poet. I am so excited for you all to hear her story! In a short time, you will be inspired, entertained, and ready to follow your dream! If you have ever felt disappointed, felt like you've failed, or feel like you lost your dream; this is the episode for you! Be sure to check out her new book of poetry, Dust on the Record, at www.dustontherecord.com! Don't forget to pre-order my book, Five Steps to Finding your Purpose and Destiny! When you pre-order, you can receive a free 30 minute coaching call with me! www.marlielovelifecoaching.com If you like Purpose is for ALL, please support this podcast through Anchor Radio. Just hit the "support" button! I truly appreciate it! On this week's episode of Purpose is for ALL, I have the amazing Sanjna Mahtab. Sanjna is a prophetic seer, blogger, and Christian life coach. Sanjna comes from a family that was Hindu and have since converted to Christianity. Learn more about Sanjna's transformation and why she feels her task is to teach people about removing the veil of the enemies tactics! Also, hear a recent story about my God revelation after my husband's car battery died. You don't want to miss this life changing episode! PS: This episode is a little longer than the others, but it's worth it! Be sure to check out my book, Five Steps to Finding Your Purpose and Destiny. Pre-order before September 28th and you can get a free coaching call with me! More information at www.marlielovelifecoaching.com. If you like this podcast, please find it in you to financially support me! Click the support link! On this week's episode of Purpose is for ALL, I have the awesome prophet Kyle T. Miller! Prophet Kyle T. MIller, a licensed and ordained prophet, has been called to the marketplace as a musician, play producer, and educator. A native of Arkansas, Kyle has been prophesying and interpreting dreams for almost 15 years. If you ever feel like you've "backslide", or feel overwhelmed with starting a relationship with Jesus, this is the episode for you! You don't want to miss this powerful episode! If you love Purpose is for ALL, I would love your support! Now through Anchor radio, I am able to accept monetary support for this podcast. If you have grown from listening to this podcast, hit that support button. Don't forget to check out my new book, Five Steps to Finding your Purpose and Destiny! Available for pre-order until September 28, 2018! Find all info on: www.marlielovelifecoaching.com. On this week's episode of Purpose is for ALL, we have the amazing Dr. Candice Smithyman! Dr. Candice is a prophetic teacher, life coach, executive pastor, and business owner. Dr. Candice has many online tv shows that showcase prophetic ministries all over the world! On this episode, find out what it means to be a citizen of Heaven. Also, if you believe that you are more of an intense person and like to get to deeply know people, this is the episode for you! Don't forget, my new book, Five Steps to Finding your Purpose and Destiny is available for pre-order until September 28, 2018! Order so you can receive a free 30 minute coaching call from me! www.marlielovelifecoaching.com If you like Purpose is for ALL, be sure to support this podcast and donate today! On this week's episode of Purpose is for ALL, we have the amazing prophet Dr. Jeremy Lopez. Dr. Jeremy Lopez is founder and president of Identity Network, an international prophet, author, life coach, and dream interpreter! While listening to this episode, you'll know what it means to to re-calibrate your brain for purpose, how God is in everything, and the moment he knew he was prophet! It was an honor to have Dr. Jeremy on my podcast! My book, Five Steps to Finding your Purpose and Destiny is now available for pre-order! Pre-order the book today at www.marlielovelifecoaching.com and you'll be able to have a free 30 minute coaching call with me! On this episode of Purpose is for ALL, we have prophet Dr. Hakeem Collins. Dr. Hakeem's passion is to ignite the purpose's in people's lives! This episode will teach you a major key to identify what God has called you to do on this earth. You don't want to miss this! Dr. Hakeem also wrote the foreword for my book, Five Steps to Finding your Purpose and Destiny! The book is available for pre-order today! www.marlielovelifecoaching.com! On the debut of season 3’s Purpose is for ALL podcast, I have the amazing Doreen Virtue! It was an honor to have Doreen on my podcast! If you didn’t know, Doreen was raised in new age and had a profound vision of Jesus on January 7, 2017 that completely shifted EVERYTHING for her! You have to hear about the changes she made in her life, to glorify God every single day! Also, don’t forget my book, 5 Steps to Finding your Purpose and Destiny is now available for pre-order! You can pre-order the book at: https://www.marlielovelifecoaching.com/online-store/pre-order-five-steps-to-purpose. When you pre-order, you can also choose to get an autographed copy OR a free 30 minute call with me! On this episode of Purpose is for ALL, I interview Brieanna Thomson, Mrs. Waialua! Brieanna is a special education science teacher for high school students and loves to empower others. During the Mrs. Hawaii pageant, she won Mrs. Congeniality and Mrs. Personality! Learn how to be "beYOUtiful" and much more from this inspirational 23 year old! On this week's episode, I interview musician Kyle David. Kyle is an inspiration to many! He went from a obedient preacher's child to almost spending a significant amount of time in jail. Through God's grace and mercy, Kyle is now walking out his God-given purpose. Learn how to go from no hope to happiness, what it means to take it one day at a time, and why my new saying is "happiness and hope!". On today's episode of Purpose is for ALL, we have the inspirational Nicole Washington! Nicole is founder of No Limit for Christ, an organization that serves as a spiritual resource for those looking to overcome bondages. She is also a co-host on the YouTube Christian Lifestyle Talk Show “ConvowithU”. On this powerful episode, Nicole explains how asking God, "why", lead her to her purpose. If you're afraid to ask God, "why", you'll want to listen to this episode! On this episode of Purpose is for ALL, I speak with Kristen Percival. She's a Believer, prayer warrior, mother, military wife, and the owner of Girl Be Confident jewelry. You don't want to miss this episode! Not only will you be inspired to live the life you were MADE to live, BUT get an impartation to be a prayer warrior too! Get to know Marlie Love, the “Purpose is for ALL” podcast creator and host. Get to know how she found her purpose and the new things going on with her! "Purpose is for ALL" Ep. 16 with Justin Balch! Justin is a co-owner of Cannabossom, a hemp company in CO. He talks about his walk with God, starting over after being in the military, and his purpose. "Purpose is for ALL" Ep. 15 with Carmen Carillo. Carmen details how easy it is to be living your purpose 24/7! If you want your eyes to be open to God, this is the episode for you! "Purpose is for ALL" Ep. 14 with life coach Tori Hallowell. On this week's episode, Tori breaks down how she found her purpose after she felt the common educator "burnout" many have experienced. "Purpose is for ALL" Ep. 13 with Jose Cordon! Jose is a 24 year old spoken word artist and business owner. We talk about self awareness, trying new things, and how it feels to have an anointing! "Purpose is for ALL" Ep. 12 with Mellinda Williams, a life coach originally from Jamaica. Mellinda explains how she lives her purpose 24/7, through motherhood, nursing, and life coaching. "Purpose is for ALL" Ep. 11 with Stephanie Crawford. Learn about Stephanie's purpose and how she learned to thrive and not just survive domestic violence and addiction. "Purpose is for ALL" Episode 10 with Amber Richardson, Empowerment coach! This episode is guaranteed to steer you in the right direction if you feel you aren't living up to your potential! "Purpose is for ALL" Episode 9 with Horace Yao. This episode, get to know an inspiring teenager that doesn't allow his age to hold him back from changing the world! I love this episode! "Purpose is for ALL" Episode 8 with Rospel Richard. Learn about how he plans to create change in the world. It's a great episode because we don't agree on everything, but still show respect. "Purpose is for ALL" Episode 7 with Michael Marra, CEO of Millennial Entrepreneur Group. Michael's mission to help fellow millennial entrepreneurs is inspiring! You don't want to miss this interview! "Purpose is for ALL" Episode 6 with M.H. Dorsett, writer and author. Learn how being kind, forgiving, and present can lead you to your purpose! "Purpose is for ALL" Episode 5 with Nilton Serva! He provides wonderful advice to anyone that's been incarcerated (he was 2x) and wants to change their circumstances! .... did I mention he's only 19! Purpose is for ALL: Episode 3 with Talia Jacqueline! An exciting episode about awakening the purpose that's dormant inside of you! Purpose is for ALL: Episode 2 with Rudy Harper, tv journalist! Episode 1: Purpose is for All! - Part 2 with Marlie Love! Find out how Marlie Love found her purpose! We ALL can find our purpose in life!! Episode 1: Purpose is for All! - Part 1 with Marlie Love! Find out how Marlie Love found her purpose! We ALL can find our purpose in life!! What do you do before you go to sleep? Find out how to have good dreams instead of nightmares!